Diego Luna attends the Hollywood premiere of Rogue One: A Star Wars Story on Dec. 10, 2016. Luna lives in Mexico City and, as a political activist, he sees himself as someone who has a voice on both sides of the border. "I have all my love stories here, I grew up here, I decided to do theater here," he says. "But most importantly, I have kids, and I have to say there's something quite interesting in living this time of their lives in Mexico versus the States." Luna moved home a few years ago. He says there's a "richness" he feels in Mexico City, and as a political activist, he sees himself as someone who has a voice on both sides of the border. "Right now, I feel that I'm useful here and that I want my kids seeing [their] dad getting involved with the place he lives in." It's quite painful to see what's happening these days, the indifference around a community that is suffering so much, you know. I can't believe that cruelty and that indifference, that lack of compassion, you know. I mean, even though there is, starting now, a reaction [to] the conditions of all these kids today ... I didn't wake up in a country that was completely indignant about this issue, you know. The government was still celebrating the triumph of Mexico in the World Cup on their Twitter. It's like, "OK, this issue matters this much." We don't give a f*** about what happens to migrants going through Mexico from Central America trying to get to the States or wanting to stay in Mexico. And the way our government treats them, the stuff they have to go through, the amount of abuse is ridiculous, it's insane. And no one seems to get affected by these things. So it's fighting indifference [that], to me, is a priority ... because we are getting used to this kind of injustice. There is something I heard recently, you know: If the rights I have are not the same rights everyone has, then my rights are privilege. It's my education. I think it's all about my father. It's what I saw my father doing. I remember my father always reading the newspaper and commenting on what was there; and how important was that debate that could happen after lunch in the house; how important [it] was to engage with the issues. I think there is an awakening happening, a social awakening happening from these terrible six years we just lived and a [drug] war that has been happening for 12 years, since [former President Felipe] Calderón started to fight the [drug] traffickers. Then we had an earthquake also that reminded us how weak we are, you know, how weak our institutions are. All these corruption scandals where we started to get an idea of how much they were stealing from us, you know. And all of this, I think it's creating an awakening. There is a need to say, "Ya basta," you know, enough is enough. And I think the people [are] already there. The problem is we are living in a very dangerous country. It's an election that is happening in a country where [more than 100] candidates [and election workers] have been killed. ... We have normalized violence and we have accepted this is the Mexico we live in. ... We have this privileged part of society that doesn't have to interact with that violence. ... "Well, whatever. You know, it's not our issue because it's the war on drugs and because there's a market in the States and it's never going to stop, so what can we do?" And you go, "No, there's a lot we should be doing," because this violence is [rising] ... and I don't believe we have to wait until it happens to us. You know, I still believe in stories and I still think we are, most of us are people that can feel for the others. And I think this election is that one where people are starting to vote not just for themselves but for the others. I think it's important to understand how did we get here. I remember when we did Y Tu Mamá También, the first time we opened the film in Mexico, we received so many messages going, like, "But why do you show that Mexico? It's so dirty, that area. Why you didn't go here or there?" You go, like, "Because that area is there." And I do think that when you hear a story about how Mexico became such a crucial place in terms of the drug trafficking, it might be important for someone in India to understand why [there is so much] news about violence and how can you connect with this. You know, [Narcos is] not a documentary, obviously, but it's definitely an issue that I care about, that it matters to me. ... And if one of every 100 people watching it decide to go a little deeper and find out what's not being said, I think that'll be good. On the initiative he helped launch called El Día Después, or "the day after"
I am worried also because we have to understand that democracy demands of you your actions to last for the whole six years [of a Mexican presidential term]. You know, we tend to think that democracy is going to vote, and then wait six years to see what happened. And what we're trying to say here is we have to work every day to bring the change this country needs, otherwise no one's going to be able to do it, and we have to shape the people in power. We have to tell them who we want, how [we] want them to behave. But to do that, we have to make sure we're behaving the same way. No. ... I have the role of being a citizen, which demands a lot from me. ... I think there's a lot that can be done from the perspective of the citizens, and a lot that we have to teach them. Samantha Balaban and Jordana Hochman produced and edited this interview for broadcast. Nicole Cohen adapted it for the Web. Mexican actor Diego Luna first shot to fame in the United States after 2001's "Y Tu Mama Tambien." Since then, he's starred in a handful of blockbusters, including recently "Rogue One." And he's about to play the leader of a drug cartel in the upcoming season of Netflix's "Narcos." He could have happily continued to live a successful life in Hollywood, but he missed Mexico. DIEGO LUNA: I have all my love stories here. I grew up here. I decided to do theater here. But most importantly, I have kids. And I have to say, there's something quite interesting in living this time of their lives in Mexico versus the States. GARCIA-NAVARRO: So four years ago, he came home. He loves it here and says there's a richness he feels in Mexico City. And as a political activist, he sees himself as someone who has a voice on both sides of the border. LUNA: Right now I feel that I'm useful here and that I want my kids seeing his dad getting involved with the place he lives in. GARCIA-NAVARRO: I met Diego Luna at a cafe near his kids' school in Mexico City. And that day, the crisis of migrant families was very much on his mind. LUNA: It's quite painful to see what's happening these days. The indifference around a community that is suffering so much, you know? Yeah, that indifference, that lack of compassion, you know? I mean, even though there is starting now a reaction of the conditions of all these kids today, I woke up in a country that wasn't completely - (speaking Spanish). LUNA: I didn't wake up in a country that was completely indignant about this issue, you know? The government was still celebrating the triumph of Mexico in the World Cup in their Twitter. It's like, OK, let's - this issue matters this much, OK? GARCIA-NAVARRO: I used to live in Mexico. I covered it for many years, and it was always surprising to me how little Mexican society values its own migrants that it sends to the United States. LUNA: And then we now say we care, but we don't give a [expletive] what happens to migrants going through Mexico from Central America trying to get to the States or wanting to stay in Mexico. And the way our government treats them, the stuff they have to go through, the amount of abuse is ridiculous. It's insane. And no one seems to get affected by these things. So it's fighting indifference what to me is a priority today, I guess, in every term. GARCIA-NAVARRO: Indifference here and indifference there, yeah. LUNA: Indifference. Indifference because we are getting used to this kind of injustice. There isn't - something I heard recently, you know, but if the rights I have are not the same rights everyone has, then my rights are privileged. GARCIA-NAVARRO: But I guess what's surprising to me is that you are a person who is privileged. You are someone who has been blessed because of your talent, and you have a lot of success and fame. So what draws you to speak out on these issues? LUNA: It's my location. I think it's all about my father. It's what I saw my father doing. I remember my father always reading the newspaper and commenting on what was there and where - how important was that debate that could happen and, you know - after lunch in the house - how important it was to engage with the issues that apparently are not happening to you. But it also is this country because the stuff you see, you see beautiful stuff next to the most horrible image. And you wanna do something because it's provocative. This city, this country has that kind of duality, you know, that - yeah. GARCIA-NAVARRO: So tell me about this moment in Mexico for you because we're right ahead of a very important election. But we're also in a moment where you see so much violence in Mexico. There's a lot at stake here. GARCIA-NAVARRO: So what is your view as to where this country's at? LUNA: Well, I think there is an awakening happening, a social awakening happening from these terrible six years we just lived and a war that has been happening for 12 years since Calderon started to fight the traffickers. GARCIA-NAVARRO: The drug war, yeah. LUNA: Yeah. Then we had an earthquake, also, that reminded us how weak our institutions are, all these corruption scandals, where we started to get an idea of how much they were stealing from us, you know? And all of these, I think it's creating an awakening. There is a need to say, llevaste, you know, like, enough is enough. And I think the people is already there. The problem is we are living in a very dangerous country. It's an election that is happening in a country where 114 candidates have been killed. And if you hear that in any civilized place, you would say, well, that election can't happen obviously. But in this country, we have normalized violence and we have accepted this is the Mexico we live in. And because we have this privileged part of society that doesn't have to interact with that violence, and then the others - well, whatever, you know, it's not our issue because it's the war on drugs and because there's a market in the States and it's never gonna stop, so what can we do? I don't believe we have to wait till it happens to us. You know, I still believe believe in stories, and I still think we are - most of us are people that can feel for the others, you know? And I think this election is that one, you know, where people are starting to vote not just for themselves but for the others. GARCIA-NAVARRO: Well, I have a - this is a fellow Latina. I'm curious about this thing. You've been talking about the violence that Mexico is experiencing, and Mexico isn't unique in that. Obviously it is a problem that we see all over Latin America. And you're in "Narcos", which is a series that Colombians look at and think glorifies Pablo Escobar, you know? It's the story that we always see about Latin America, about these very violent figures that are the only thing that people outside of this area sometimes get to see about us. How does that fit into your worldview? LUNA: I think it's important to understand how did we got here, you know? And I remember when we did "Y Tu Mama Tambien", we - the first time we opened the film in Mexico, we received so many messages going like, but why did you show that Mexico? It's so dirty, that area. Why you didn't go here or there? You were like, because that area is there. And I do think that when you hear a story about how Mexico became such a crucial place in terms of the drug trafficking, it might be important for someone in India to understand what - why are these news about violence and how can you connect with this, you know? And you will see it talks a lot about how much the government has to be in both for this situation to happen. And I think by the end, you go, like, holy [expletive]. So, really, that's how things happen? And if one of every a hundred people watching it decide to go a little deeper and find out what's not being said, I think that'll be good. GARCIA-NAVARRO: So tell me about your - you have a project called "El Dia Despues", the day after. So explain what that is. LUNA: It's just a platform that - where we are talking to other citizens. This election is - it's bringing a fracture to society, you know. So what we're doing is we're saying it doesn't matter who you vote for. The next day, we're all going to wake up in the same country. And this country has to include all of us, you know? So we're also putting out videos that explain how this violence raised and how much this violence can become a problem for the next six years of our lives, you know. LUNA: I am. I am. I am worried also because we have to understand that democracy demands of you, your actions, to last for the whole six years, you know. We tend to think that democracy is going to vote and then wait six years to see what happened. And what we're trying to say here is that we have to work every day to bring the change this country needs, otherwise no one's gonna be able to do it, you know. And we have to shape our - the people in power. We have to tell them who we want, how they want them to behave. But to do that, we have to make sure we're behaving the same way, you know. We have to make sure we're consequent with what we're asking. GARCIA-NAVARRO: They have asked you to be a senator. GARCIA-NAVARRO: Do you see yourself ever possibly becoming a politician, having a role politically in this country? LUNA: No. Well, I mean, I have a role. I have the role of being a citizen, which demands a lot from me. But no, no, no. I don't think so. GARCIA-NAVARRO: An elected official, you don't see? LUNA: No, I don't think so. No, no. I think there's a lot that can be done from the perspective of the citizens and a lot that we have to teach them. So I'll be there. 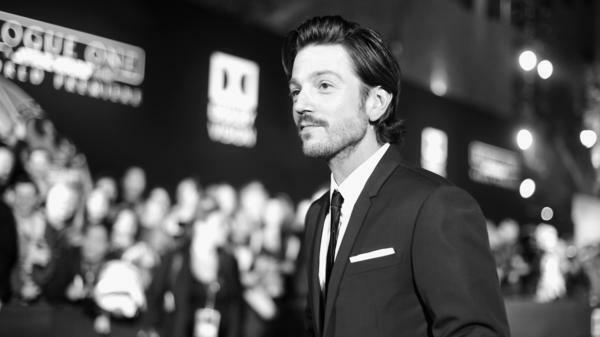 GARCIA-NAVARRO: Diego Luna, actor and activist. LUNA: Gracias a ti. Transcript provided by NPR, Copyright NPR.